* Beauty contains more than 100+ beautiful makeup styles and filters. * It's can help you remove blemish,whiteheads,blackheads,pimples,acnes and rosacea to get a flawless skin selfie. * Change eye color and overlay makeup to style your look any time. * Eyebrow Editor, easily find the best eyebrow style for your face's and edit your look. * Instantly enhance your complexion glow with our "Beautify" tool and "Flawless" skin is yours with adjustable skin tones and effortless tans to give your selfie a polished, finishing touch. * Add blush and contour! remove shine for a pristine, natural look.Unique,amazing and vivid motion numerous of filters. * Face Swap Insta : Selfie possesses powerful photo editor functions. * Manage effect using Increase & Decrease progress bar. --> Candy Selfie photo dozens filters and makeup help you to beautify photos in a smart way. --> Crop photos to any size as your wish. --> Make your own meme 3D Glitch Effect Style Edit in this apps make over. --> Include New Color gradient(RGB) on! 80+ Lipstick. * Save your final result to your gallery and on your SD card. * Get dark eyes, straight nose and V-shaped face in seconds! * Click Smile, then mouth slightly upward to show more charming smile. • Create great in makeup! • Lot's of Filters from the Romantic to the Dramatic! • Hair Changer, Colorant, colorize, Colors of Blonde, Burgundy Hair & Lipstick! • professional makeup technique filters! • Eye Brow Colorizer, Eye Changer by InstaSelfie Makeover camera! * Painting and graffiti, can freely set the brush size and hardness, to meet different needs fo beauty tips You Beauty Makeup. There is no other app that functions like a real camera You Cam Beauty Make up. 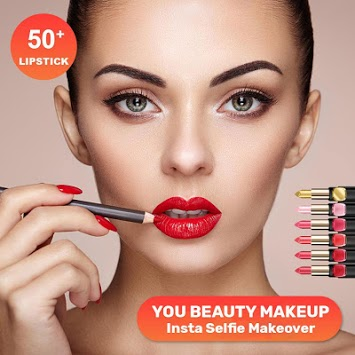 You Beauty Makeup : instaselfie makeover Camera Great photo Editor for Instagram, Snapchat, Twitter and Facebookcomes from PIP Camera big family.